Your closet is filled with clothes that make your heart sing every time you get dressed. It takes you about 3 minutes (if that!) to pull a fabulous outfit together each morning, and you always feel great as you leave the house. You have just the right number of clothes and wear everything in your closet. You get compliments right and left but mostly you have this inner, heartfelt sense that you look great. What do you think when you read that? Do you feel like you’re there most of the time? Or, does your head immediately say, “That’s a pipe dream. Maybe it works for other women but I ________ (don’t like to shop, am hard to fit, don’t know how to put things together, don’t have enough money, live in a super casual town and everyone would make fun of me…).” Watch where your thoughts and feelings go – this will tell you a lot. So, is it really a pipe dream or can it be reality? If you don’t already experience this regularly, what needs to happen so you do? Yes, the technical “know how” is necessary to create a wardrobe you love, but it’s equally as important to look at the intangible stuff that is keeping you stuck. Most importantly, it is absolutely true that you will stay stuck if you stay mired in your story about why you can’t have what you want. Believe me, I’ve been there done that with many things in my life. But, it doesn’t have to be that way. As long as you are taking one baby step at a time you will make progress, and it will feel good! If you haven’t already used my free e-course (it’s a new addition to your Nurturing Beauty newsletter subscription (you can get it here: https://totalimageconsultants.com/subscribe/), I highly recommend using that as a first step. It helps you clean out and make space for new beginnings. 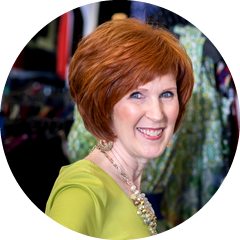 So as not to overwhelm you, I’d like to offer 4 steps you can focus on to help you move in the direction of a wardrobe you adore. If this is new to you, just focus on one at a time. Hold out for what makes you happy. So many women say that they “had” to buy something because there was nothing else or “it was functional.” Yuck. No, please don’t let those words come out of your mouth. This way of thinking will never, ever serve you. If you don’t find what you want, keep looking. If you don’t know what you want (or don’t know what you don’t know you want (if you can follow that), enlist help. But, no matter what, never choose something based on function alone or bring something home simply because you couldn’t find anything better. That is how ho-hum, “not horrible” and boring, uninspired wardrobes happen to good people! When you are trying on a garment in the store, be sure to “complete” the outfit as closely as you can in the dressing room so you give the garment a fair shake when it comes to being a contender for space in your closet. Too often, I will see a woman put on something like a dress while she’s wearing butterfly ankle socks and a sports bra and then say, “This doesn’t work at all.” Well, she’s right. But, perhaps if she put on a pair of shoes (or at least took off her socks) and went shopping with a proper bra she could honestly evaluate the dress. Believe me, it really does make a difference. Sure, you might still not love the dress but at least you’ve given it the old college try! Then, of course, only buy the dress if you know that you have the perfect sweater to go over it and shoes to go with it and that you are willing to tailor it if it needs it, etc. Having a dress sit in your closet because you’ll be cold and have nothing to keep you warm when you wear it or you can’t bear to spend the money on the tailoring (if that’s the case, we really must have a little chat! ), then you are best leaving it at the store or returning it if you get it home and it just sits there. Watch out for limiting personal style beliefs. This is a biggie, and I hear it all the time. Things like: “There are no shoes out there that fit me.” “All the styles are too _________ big/small/old/young/black/shapeless… for me.” “I can’t wear that because no one I know does and I’ll look out of place.” These are just a few examples of the kinds of things we tell ourselves that keep us stuck and limit our options. I’m not suggesting that you overcome all of your limiting beliefs with a snap of your fingers (although wouldn’t it be lovely if that could happen!). Just become aware of what you tell yourself (even if you believe beyond a shadow of a doubt that it is true). Maybe try shifting one that has the least hold on you first. Say something like, “More and more I’m finding shoes that I like and that fit me.” For some inspiration, I highly recommend Cheryl Richardson’s and Louise Hay’s new book called “You Can Create an Exceptional Life.” It’s an excellent resource and so uplifting. Expect, welcome & celebrate the learning curve. Chances are good it has taken you a while to get stuck (it doesn’t usually happen overnight). So, give yourself a break and celebrate each new success no matter how small. Perhaps you left something at the store that you normally would have bought and never felt good in (or a year from now it would still be sitting in your closet with the tags on it). YAY! Maybe you catch yourself saying, “I can’t wear a skirt with knee high boots, I’m too old” and then decide to try it on (completing the outfit as much as possible, of course). Even if you don’t buy it, give yourself a big YAY! Each time you do you set yourself up for more and more success – the universe just works that way. Lastly, write these tips down on a 3×5 card and keep them with you – especially when you are in a dressing room. Expect, welcome & celebrate the learning curve. If you need some guidance to get you going, “Who Taught You How To Dress?” is the perfect companion. Not only will it walk you through limiting beliefs, exploring your inner beauty and helping you learn how to shop from your heart, but it also gives you access to a very special ‘How to Dress’ online forum where other like-minded women (including me) are exploring all of these things together – asking questions, posting stories and even taking pictures and asking for help. There is nothing like it out there and can give you the guidance and support you need to create a dream wardrobe – even long distance! Learn more at www.whotaughtyouhowtodress.com.